View of one of the carriage roads intersecting with the Turtle Back trail. You know how it is, hikers. There are moments, in your day-to-day life, when the burdens of work and/or school and/or family life get to be a little unmanageable, and you feel that the only cure for it all is to get your boots on and get out into the woods. For me, it had been one of those weeks. Or rather, one of those couple-of-weeks. Between work, graduate school projects and 10 million other duties and responsibilities, I’d been practically chained to my computer. And it didn’t help that I’d spent too many weekends recently catching up on all the things I hadn’t been able to do during the week. I felt like doing something local (or at least something that didn’t involve taking the Garden State Parkway or the NJ Turnpike), and decided to head down to South Mountain Reservation in West Orange. So that Sunday morning saw me making my way down Pleasant Valley Way toward the reservation. I left my car at the Turtle Back parking/picnic area, started stretching, checked the map, took a swig of water and headed off into the woods. 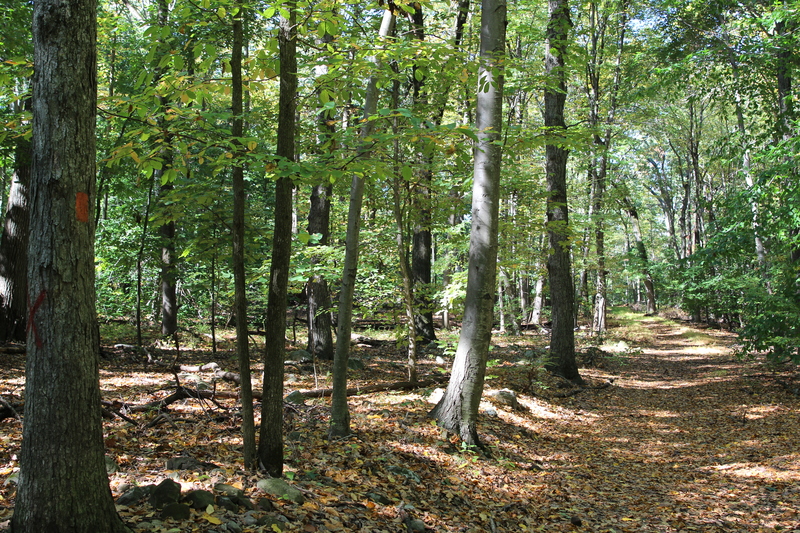 South Mountain Reservation is owned and managed by the Essex County (NJ) Department of Parks, Recreation and Cultural Affairs, and maintained/supported by the South Mountain Conservancy. The reservation is spread across three towns: West Orange, Millburn and Maplewood. For hiking, there are several blazed trails, plus a number of carriage roads/bridle paths and a couple of unmarked footpaths. On this particular hike, I did two trails. One is the one-mile interpretive loop trail (bi-colored white and orange blaze) out to Turtle Back Rock. The other is the longer (three and a half miles at least), orange-blazed Turtle Back trail that goes down into the core of the reservation in kind of a long, skinny north-south loop. One thing you have to know about hiking in South Mountain. Most of the trails, carriage roads and unmarked footpaths ultimately hook up with each other at one point or another. So you’ll have multiple ways to get from point A to point B, but if it’s a particular trail that you’re trying to stay on, pay attention to the blazes. The first time I visited, I ended up getting veered onto one of the carriage roads. Still got where I was going, but it took me a bit longer. There’s a trail map on the county website – it helps to print out a copy and bring it along. I also brought my compass with me to play it safe. Saw a few people out taking the interpretive trail, and quite a few others – families with kids, dog walkers, etc. – out on the carriage roads. All of them were just as pleased about the nice weather – and even more pleased that they had a few spare hours to enjoy said weather. 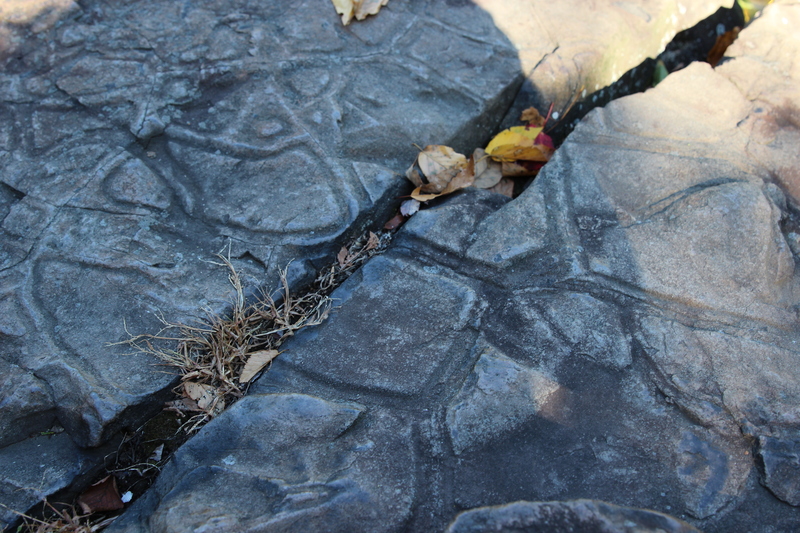 Close-up of some of the markings on Turtle Back Rock. I decided to do the loop hike out to Turtle Back Rock as a warm-up before taking on the longer trail. The interpretive loop is nice and easy; the longer trail, in terms of difficulty, is about moderate. The trail goes up and down some ravines in spots, so I’d suggest bringing hiking poles if you’ve got them. For those who don’t know from Turtle Back Rock, it’s a basalt rock formation on the northern edge of the reservation. It’s of interest because it has all these striated lines in the surface that resemble the markings on a turtle’s shell (hence the name). And on sunny days, it’s a nice place to bask (like a turtle) and watch the traffic zooming by on Northfield Avenue down below. So I sat, took a swig of water, ate an apple, studied the map and just took in the view. The striations on the rock weren’t as well-defined as I remember from my last visit – whether it’s because of erosion or just a distorted memory, I’m not sure. I was also disappointed to see that someone had been out spraying graffiti on the rock. Finished the interpretive loop, which then took me to the main Turtle Back trail. Pine Grove: As the name suggests, it’s a grove of pines. You’ll find it in the southwest part of the Turtle Back trail, near an intersection with the Lenape Trail and a footbridge that leads over to the zoo. The ground beneath the trees is absolutely covered with pine needles – so many that it almost looks like a golden carpet. There is also a small river (more like a brook) running through the ravine in the north-central part of the reservation, and the trail runs parallel to it for a short stretch. So it’s a nice place to stop, drink some water, study the map, or just listen to the burble-burble. For the last mile of the hike, there was a bit of climbing back up the ravine to the northeast, back toward Turtle Back Rock. It was a bit of a push, but not impossible. By this time, I was starting to get a little warm, so I took off my red Montclair State sweatshirt (which is what I usually wear for cool-weather hiking) and tied it around my waist. I arrived back to the connecting trail that takes you to the interpretive loop and to the parking lot. I was a little winded and footsore by now – that’s usually my signal that it’s time to quit for the day. But mentally, I was feeling a heck of a lot better. I’d gotten some nice fresh autumn air into my lungs, and forgotten about the work and grad school tensions for a while. Sure, I’d be back to worrying about all that stuff first thing Monday morning, but that was still in the future. By car: Most sets of directions to the reservation involve Pleasant Valley Way. It’s accessible from I-280. But if you’re coming from Montclair, Verona or other parts north, you can take Bloomfield Avenue to Lakeside Drive in Verona, which will turn into to Pleasant Valley. Either way, head south until you get to the Northfield Avenue light (you can’t miss it – you can see the zoo and the recreation complex from there). If you’re heading for the northern end of the reservation, hang a left and follow the signs – you can either enter by way of the zoo, or hang a right onto Walker Road, a few lights down. If you’re heading for the southern end, head straight through the intersection. (The road will become Cherry Lane, and then Brookside Drive.) Keep heading straight until you reach Glen Avenue in Millburn. Hang a left and you’ll eventually come to the Locust Grove parking area. By train: The NJ Transit station in Millburn (Morris and Essex Line) is near the southern edge of the reservation and the Locust Grove parking area.